If you enjoyed our post on the farms of Long Island, you may be excited to hear that there are also farms in Westchester that you can visit with kids. Seriously, less than an hour from New York City your kids can be gamboling with sheep, rounding up chickens, and milking cows. The first one we hit was Muscoot Farm. It's the farthest away (about an hour) in Somers, NY, in Northern Westchester. I was amazed at how rural that part of Westchester is. It really feels like the country, and it's so close to Manhattan. Muscoot is actually a Westchester County park and is free to visit. They also have free or inexpensive programs, workshops, and occasional festivals. There is a farmers market on Sundays with vendors from area farms selling produce, honey, baked goods, and wool. There are also hiking trails and picnic areas available to everyone. There are workshops for preschoolers (aged 3-5) and older kids that let children really get into and learn about farm work and the nature on a farm. For instance, workshops include Caring or Chickens, Caring for Sheep, and Morning Chores (where kids get to help feed and groom the animals). September's Harvest Day invites families to help harvest the gardens, and a Scarecrow Making Workshop generally takes place in October. Check the farm's calendar for upcoming events. 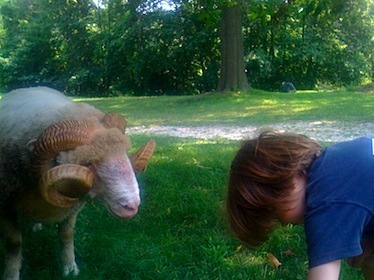 If you live in or near Muscoot Farm, the Farm Camp is a real hands-on farm experience for kids to learn and do all the farm chores and learn to care for the animals. It sounds pretty great and, not surprisingly, it fills up the first day that registration opens. Unfortunately for the rest of us, there is no transportation to the camp. The only thing I didn't enjoy about our visit was the hayride. It was just long, boring and hot. Other than that we had a lot of fun at Muscoot Farm. We also visited Philipsburg Manor, which is part of the Historic Hudson Valley network of historic homes, like Sunnyside and Kykuit . In fact, you can buy a package tour of Kykuit and Philipsburg Manor together, but you don't want to do that with kids, because they'll think Kykuit is boring - and you'll easily spend the whole day at Philipsburg Manor. I was recently bemoaning the fact that my kids might never have the opportunity to milk a cow. But you can actually do this at Philipsburg Manor. How cool is that! Look, my girl's obviously inherited her farm girl genes. She's a natch'. NOTE: Unfortunately, Philipsburg Manor no longer has farm animals. The other cool thing about Philipsburg Manor is that it's really a museum, and you can take a tour of the farm house and the grist mill. In the house kids learn about how the farm was once run by slaves, and how they lived there. Kids don't often learn that slavery was a big thing in New York, so it's kind of cool for them to get this perspective. In the mill, you get to see how they used the power of the river to turn corn into meal. Kids can hand turn a miniature version of the mill stones to see how hard it is and then see the inner workings of the real one. The guide will turn the mill on and you can see how the water makes the wheel turn and that in turn makes all the gears turn and then the corn meal comes out of the mill. It's pretty cool. And then you can buy a bag of stone ground corn meal that they made there and really know what they mean by "stoneground". Note: Philipsburg Manor costs $12 per adult and $6 for children over 3. Closed Tuesdays and Mondays (except holidays). Philipsburg Manor's Green Corn Festival generally takes place Labor Day Weekend and is a weekend full of activities exploring the culture and history of area Native Americans. 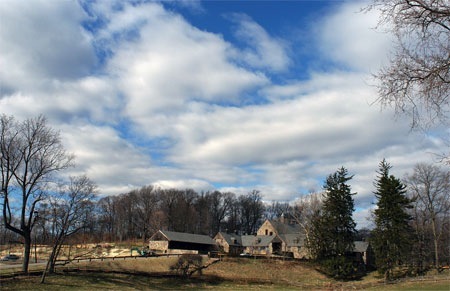 Nearby to Philipsburg Manor in Tarrytown is the Stone Barns Center, 80 acres of gardens, pastures, and woods dedicated by David Rockefeller to teach and promote community-based food production and enjoyment. Stone Barns is open Wednesday through Sunday and offers many different workshops and tours, but what really makes Stone Barns stand out from the others is the farm to table connection because, of course, you wouldn't visit Stone Barns without stopping for lunch at the Blue Hill Cafe - a chance to get a small taste of the amazing gourmet eats that most of us will never have a chance to try at the Blue Hill Restaurant and marvel that most of the food prepared there comes from the farm just outside its doorstep. Now that's being a true Locavore! Some of the events to try to catch at Stone Barns include the Farm Markets on Wednesdays, Fridays, and Sundays, where you can buy produce grown right on the farm. Bored of going apple picking? How about Pick Your Own Eggs, where kids get to feed the chickens and then gather eggs. After learning how they are sorted and packaged to go to the store, kids can take theirs home! The popular Farm Chores Workshops let kids participate in the seasonal activities of farm life. It could be feeding animals, working in the garden, or gathering eggs. There are also tours that take you around to meet the animals, farmers, and gardens. All workshops and tours have different fees, and you can sign up online to reserve a space, but you can also just visit the farm and wander around checking it out on your own. The farmers are happy to talk to you and love to answer questions from kids. There are also lots of hiking trails to follow which help you deserve that lunch at Blue Hill Cafe. 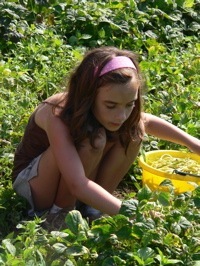 Stone Barns also offers a week long summer camp program where kids can really get their hands dirty. This is another one of those camps, though, that fills up fast, so if you think you might be interested, it's not too early to check it out now. For full coverage of apple picking, pumpkin picking, strawberry picking and farm fun info in the tri state area, check out our Pick Your Own Guide.